I make a lot of homemade bread! Before having kids I had never tried making a loaf of bread, much less baking a loaf or more a week. Now that I have two very active and growing boys we go through a lot of bread, so both to save money and for the taste (not to mention the health aspects), I bake all my own bread. I always thought that baking homemade bread would be very difficult. Don't get me wrong, I went through a number of bread recipes that didn't rise and I had to throw away or start over from scratch. After learning what recipes work and how to modify recipes to my needs I have found that making bread from scratch can be both relaxing and enjoyable. One of my favorite ingredients to add to bread are seeds. They are a great way to add protein and nutrients to bread and best of all they are great in toast. About a year ago I started using flaxseeds in my bread. Flaxseeds are full of essential fats and fiber and create a delicious nutty flavor to breads. The following is my recipe for Sunflower and Flaxseed and Bread. Combine water, honey and canola oil. Stir yeast into flours and then add flour and remaining ingredients to water mixture. Either using a mixer with a dough hook or by hand knead the bread for 6-8 minutes. Grease a large bowl and add dough, turning to coat, cover with plastic wrap. Let rise until doubled (approximately one hour). Punch dough down either roll out into a rectangle, roll up jelly roll style and pinch seems or form into a loaf and place into a greased loaf pan. Cover with plastic wrap and let rise until one inch above the top of the pan. Place dough into a preheated 350 degree oven for approximately 35-40 minutes. Check after 25 minutes and if browning too quickly tent with foil. To ensure the bread is fully done temp to 200 degrees in the center. Let cool on a wire rack. That's it! Flaxseeds are great in bread and everyone in my house loves this bread toasted. It's great with jam or melted butter. Adapted from a recipe on the back of the Bob's Red Mill Flaxseed package. Labels: Baked Goods, Bread, flaxseeds, Nuts, sunflower seeds. This recipe looks delicious...! We love bread in our house and I'm always looking for great new recipes. Thanks for sharing! We love bread in our house too :) I hope you like the recipe if you try it! 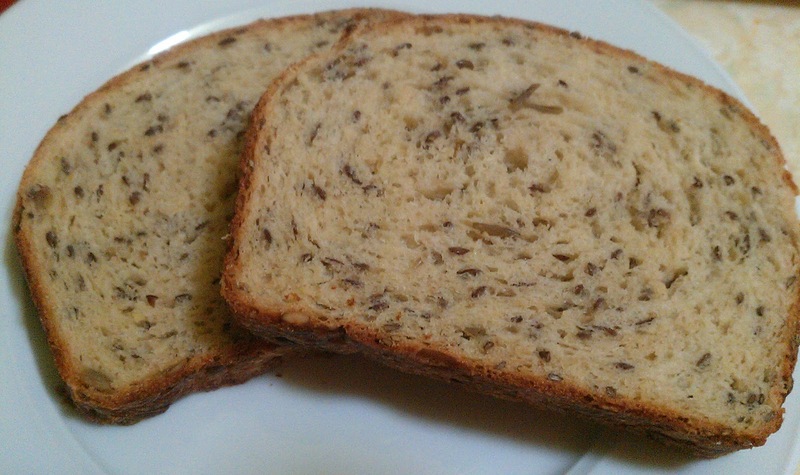 I have been looking for ways to add more flax seeds to my diet but I never thought of bread. I am trying this! I am visiting from It's So Very Cheri Blog Hop. I am now following you on Linky Followers and would love a follow back. Sometimes just bread and butter can be the best food! I like the seeds added. The key with bread is to let it rise the right amount of time. And most important to find a great recipe :) I'm not sure if flaxseed goes by another name or not. That's a good question, I will have to look into it. Have a great week also! oh..i can just smell it now!!! thanks! Fresh bread does smell great, yum! Same story for me. I stated baking bread once I had kids. It is a lot cheaper and healthier. This recipe sounds wonderful! It is so much cheaper and healthier I agree! Thanks for the link :) Have a great weekend! Yeah, another great way to get more flax in the meal plan. thanks. I have been trying to add more flaxseeds to our meal plans. I made cookies the other day with flaxseed meal instead of eggs and they were delicious! Thanks :) My boys love it!